Irresistible Food & Drinks For Your Business | Chill Masters, Inc.
Chill Masters is your southwest authority for specialty foodservice and concession equipment. 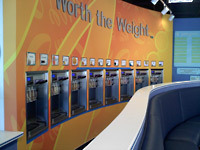 We are exclusive distributors for Arizona, New Mexico, and El Paso, Texas for Stoelting Soft Serve Frozen Yogurt machines, Stoelting by Telme batch freezers, Stoelting by Ross Frozen Custard freezers, Wadden 24 Flavor Systems, and Perfect Fry Ventless Hoodless, Self-Contained, Automatic deep fryers. We are a full service distributor with parts and service. We service what we sell.